▲ KU ice hockey team is preparing for the match. Photographed by Kim Yeojeong. The seventh match of 2019 Ice Hockey University League (U-League) was held on March 29 in Korea University (KU) Ice Rink. KU was defeated by Yonsei University (YU) where KU scored four goals while YU scored five. 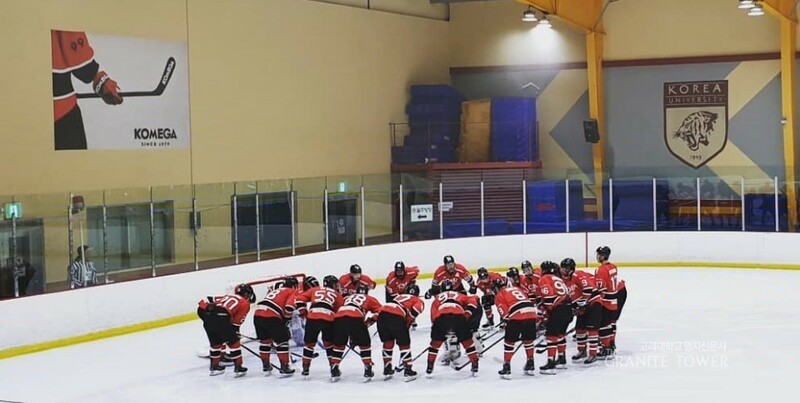 Held by Korea University Sport Federation (KUSF), U-League for ice hockey has entered the second season after the opening game on March 23. As the last season, five universities will be joining the league: Kyung Hee University, KU, Kwangwoon University, YU, and Hanyang University. Even before a minute passed, Kim Won-min (YU) scored the first girl of the match. YU charged forth with a mighty force but Shim Hyun-seop (KU) made a brilliant defensive play. With Jung Hyun-jin (YU) receiving a tripping penalty, KU outnumbered YU leaving a bit more than a minute until the end of the first period. In the 19th minute, Lee Min-jae (KU) made a tie goal assisted by Lee Jae-hee (KU) and Lee Ki-seok (KU). The first period ended in 1-1. As the second period began, YU took the lead with Jung Hyun-jin’s (YU) goal. After three minutes, Yoo Beom-seok (KU) scored an equalizer. In the tenth minute, Kim Hyo-seok (YU) scored a goal assisted by Ahn Jae-in (YU) and YU made its bid for victory with Kim Won-min’s (YU) second goal. The second period ended in 2-4. In the eighth minute of the third period, Kim Hyo-seok (YU) kept the team inlead by scoring a goal, making the score 2-5. However, KU started to launch counterattacks. In the eleventh minute, Kang Min-wan (KU) scored goal and made another goal after four minutes. Both teams went through a tough competition and KU carried out fierce attacks, however, the match ended in a victory for YU. Final score: KU 4-5 YU. Even though the match was not part of the annual Ko-Yon games, many KU students attended the venue to cheer for their team. No matter what the result is, with freshmen rookies showing a good performance, KU’s ice hockey team is highly anticipated to carry on last year’s victory at an upcoming Ko-Yon games.